I'm very picky about what I want in a sketchbook. It can't be too small to sketch comfortably, or too large to carry with me. It must have watercolor paper in it. I prefer portrait format. Both sides of the paper should be the same. Preferably hardbound, not spiral. Again and again I purchase some commercial sketchbook, hoping that this will be the one to make me happy. Sometimes I dislike the book so much that I move on to the next without even finishing it, which is why I have ELEVEN sketchbooks going at the moment. 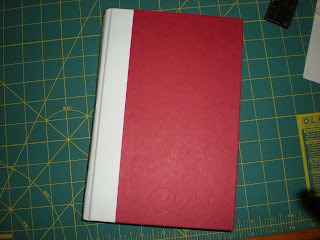 Well, make that twelve now because I just made my own sketchbook a couple of days ago! And I love it, and wish that I had done so sooner! I went to the art supply to see if I could use my 40% off coupon for a nice watercolor sketchbook, only they didn't have the one I wanted or anything else that I wanted to try. They did have a terrific sale on paper though, so I scooped up a bunch of paper and told my husband I'd make my own. 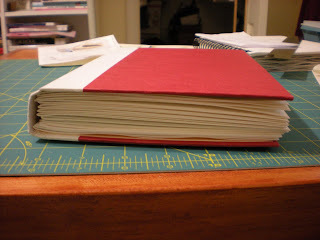 Keep in mind that I had no supplies for bookmaking on hand. I thought I'd improvise. Because that's what I do. I'll skip telling the hows and just send you to the two sites I used. 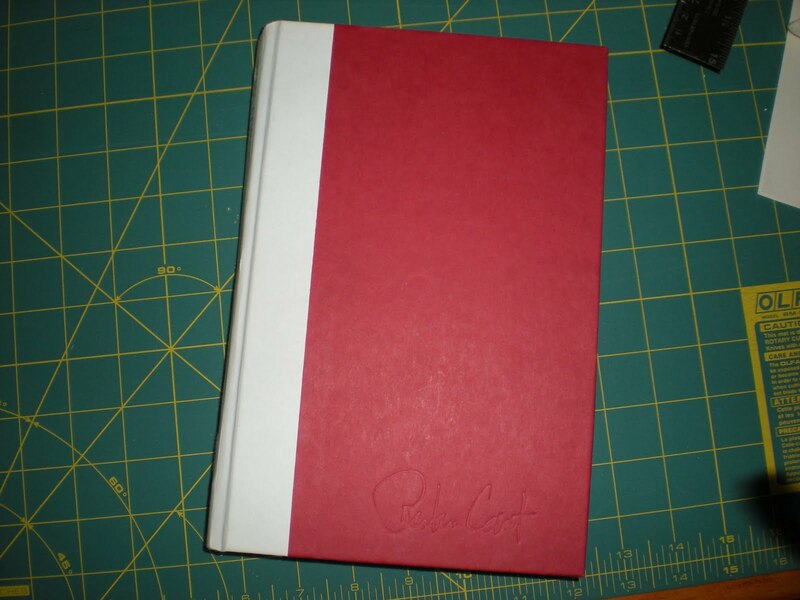 I'd like to thank Shirley for the information she has on her blog, and for the inspiration--her journals are so beautiful! And Martha of Trumpetvine Travels for her instructions. This was much easier than I thought it would be! My book doesn't look great, but I learned tons my first time out! Remember the "improvise" I talked about? First, I didn't have the proper thread, so I thought dental floss seemed like a good replacement. It went together quickly and easily with that, but when I finished I realized I had put too many folios and it didn't fit very well. So, I tried to take one off and that is when I discovered dental floss wasn't as strong as I had believed. My only other option was some hemp that I had for making bracelets. So, I restitched the whole thing and when I got done, it was once again too fat. I removed the top folio. It was still just a little too big, but I glued it in anyway. This book is VERY strong, though it looks a little funny because the middle mushes out a little. Don't use hemp. While it is strong enough, it is also so thick that it makes the spine of the book fat, while the other side is skinny. If you're already having problems with the thickness of the spine, for goodness sake, don't cover the gaps left between folios with strips of paper, which makes it even thicker! It really is not a difficult procedure and with the right tools, it should be easy to make a sketchbook just the way you want it! I'll be going for some bookbinding thread as soon as possible! Buying the paper on a mega-sale, each sketchbook that I make will cost about $6. 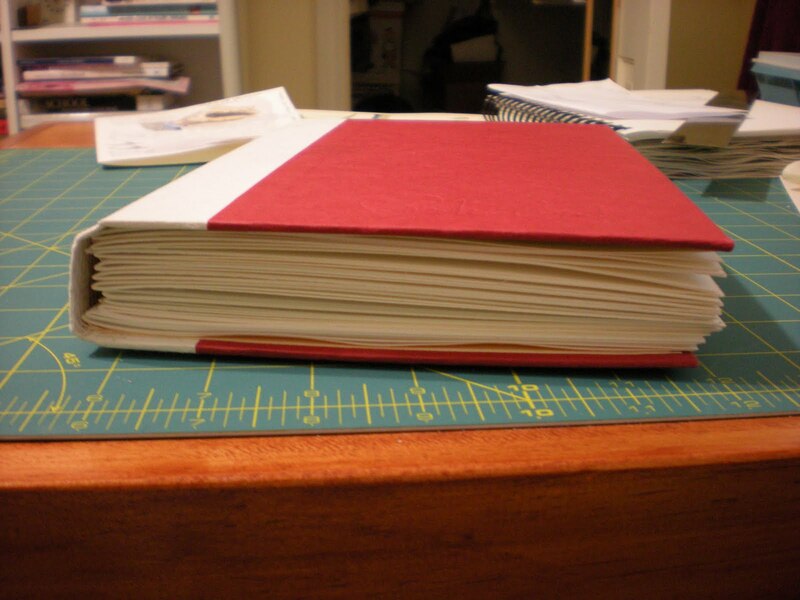 I have enough to make three 9" x 6" books of the 90lb Frabriano cp paper that I bought. (This book counts as one of them.) And I also bought some 140 lb Canson cp which will make three more. I'm set! Except maybe for the string. Definitely need that! Oh, and some pretty endpapers to dress it up some!